A seemingly simple invitation that was given and accepted has now "taken on a life of its own!" In the words of Mike Skinner, Guard Commander of the Leduc Fire Regional Guard of Honour. And word has spread like wildfire with Mike receiving calls from other fire stations across Canada wanting to know how they did it. It all began innocently enough just over a year ago when a couple of the Leduc Fire Regional Guard of Honour (LFRGofH) members were on vacation in Ireland and they stopped in to visit a Firehall in Dublin. After sparking up conversations with some of the members, they discovered that they had walked into the hall that housed the base for the world renown Dublin Fire Brigade Honour Guard. During the course of casual conversation one of the Dublin Pipes and Drums members invited the Leduc members to March in their St. Patrick's Day Parade that year which was only days away. The men had to decline because they had not brought their uniforms on that trip so the offer was extended to march in next years' parade instead. Upon returning home this invitation was brought up to the rest of the Leduc members of the LFRGofH and after seeing everyones interest, Guard Commander Mike Skinner started researching the possibility. "When I started looking into it I realized there was a very stringent process in being able to participate in this event." said Mike. "After we vetted out that it was an official invitation we had to prove to them that our Honour Guard held to the same beliefs and standards as they did, and that we were a professional and uniformed organization." The LFRGofH consists of 22 members primarily from the City of Leduc Fire Dept. but also having a few members from both the County Fire Dept. and Airport as well. All of their duties in the Honour Guard are on top of their regular duties as firefighters and they participate in the Canada Day Parade, at the inauguration of Mayor and Council, certain special events and at funerals for ex-members in the service. Once everything came back as a go, they knew it would not be an inexpensive trip to get 15 of their members over to Dublin for a week so the fundraising began immediately. Completely sanctioned and supported by the City of Leduc, the Honour Guard still had to finance the trip themselves. So a number of fundraising events were held over the last year that included a golf tournament last summer and culminated in a very successful pub night at Burnsey O'Flanagans on March 1st. 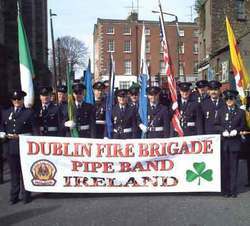 The Dublin Fire Brigade (DFB) has an extremely long and illustrious history that officially dates back over 150 years but the roots of the organization can be traced back more than 600 years. Centuries ago, on St. Patrick's Day, men who consisted of a type of 'honour guard' used to protect the Lord Mayor who, carrying a staff signifying his power, led a parade through the streets of Dublin. This same staff, which is now over 600 years old, is brought out and still walked through the streets of Dublin leading the St. Patrick's Day parade surrounded by the Dublin Fire Brigade. Due to the value and historical significance of this staff, other honour guards that have been invited to take part in the Dublin parade have always walked behind the DFB. It is of particular honour that the LFRGofH has actually received special permission to walk WITH the DFB in the parade! This is also the first uniformed Canadian contingent to take part in the parade. "We are super excited!" said Mike. "This is a once in a lifetime event. Usually its huge departments like New York or Boston that get to go. For little old Leduc to go I'm pretty impressed!" For two of Leduc's Deputy Fire Chiefs its pretty impressive and meaningful as well. Both D.C.'s George Clancy and Gerry Kelly have strong Irish roots. D.C. Kelly, who belongs to the LFRGofH is also going on the trip. Once word got out that they were making the trip to walk in the parade Mike not only started fielding calls and emails from other fire stations congratulating them and asking how they managed it, but they are now completely booked up to attend formal functions every day they are in Ireland! "We are so honoured and humbled to go." confessed Mike. "We have had a City of Leduc Brigade flag mounted in a shadow box and we will be presenting it to the Dublin Fire Brigade central fire department." Over 1,100 people march in this 2.5 hour long parade, with the DFB, and this year, the LFRGofH leading the way. "I have to say that the Dublin Fire Brigade has been so hospitable and welcoming." said Mike. "It seems to mean as much to them that we are able to come as it is for us to go. They have really helped us out in organizing different aspects of this trip and some of their members are even picking us up from the airport when we arrive. It was their suggestion that we march in their ranks as well. It rekindles the Esprit D' Corps within the department." The LFRGofH fly out from the Edmonton International Airport on March 12th and return on the 19th. We wish you a safe trip gentlemen, and we know you will do Canada, and in particular Leduc, proud. So for one and all, near and far, Irish in reality or just at heart may we wish you 'Beannachtam na Feile Padraig!' Happy St. Patrick's Day!